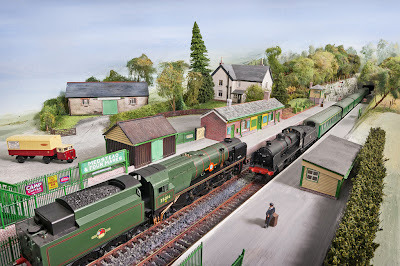 Chris Nevard Model Railways Blog: Medstead & Four Marks needs saving! This delightful OO gauge working model of Medstead & Four Marks station on the preserved Watercress Line could soon be going to the local tip if a new custodian cannot be found. Sadly its creator passed away a couple of years ago and now his widow needs to downsize which means that this cracking model of this well known Watercerss Line station needs to go to a new home or tragically be broken up. The layout is a permanent layout which has been built into the loft room, but having examined it, I think with a little careful use of a jig saw and Dremel to slit the track to create some baseboard joins for extraction through the loft hatch. later reassembly at its new home could consist of a simple sub baseboard which would support the original structure. The layout as seen here is around 75% complete, so there is plenty of scope for a new owner to make his or her mark on it whilst allowing its creator's vision to live on. Fiddle yards are built into the property, so the the owner would need to build new ones, these could either make the layout form part of a roundy-roundy or end to end depending on location. The size of the scenic section is around 10 feet long and about 2ft 6 inches deep, and to my eyes the station area looks to be around scale length as I discovered whilst trying to match my model shots to photos of the real station whilst shooting this delightful layout for a forthcoming Model Rail magazine. There is no stock supplied, the locomotives and trains here being borrowed from a Mid Hants Railway driver for the shoot. But luckily most of the trains suitable for this model can be found ready to run, and of course it being a preserved railway means that almost anything will go! The model is based near the Watercress Line in Hampshire, and If you'd like to discuss giving it a new home drop Eddie Field a line on eddie @ bussolutionssouth . co . uk (remove the gaps) who'll be able to give you more information and arrange a viewing for serious seekers.